My 7-year-old son, it seems, has suddenly learned fiscal responsibility. But it wasn't the ailing economy, or thoughts of a car that started him on the road to saving, it was Nintendo. Two months ago, the day Nintendo announced when their DSi portable gaming system was coming to the U.S. for $170, Tristan said that he would be buying one with his allowance. As impressive as his declaration was, the fact that he's stuck to it, inching toward the gaming system $7 a week, is unheard of. And Tristan isn't the only grade schooler saving, it seems. Many in his class have decided to start tucking away dimes and dollars toward the portable, looking to join Nintendo's existing fan base. But what is it that's so attractive to young gamers? 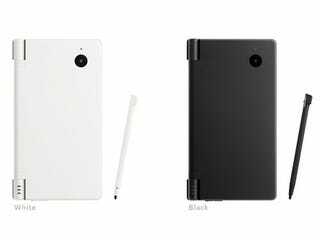 The DSi is essentially a redesigned Nintendo DS. A gaming system that is a bit sleeker, a tad lighter than the original but with the added benefit of a slightly larger screen, two digital cameras, a microphone and built in software that allows you to manipulate sound and images on the fly. Sure the cake was neat, but what about the DSi? The biggest draw for children, it seems, is the ability to take and manipulate photos. Tristan spent a good part of a day playing around with the system, taking pictures of himself and tweaking them. The DSi can store more than 400 pictures and comes with nine filters which allow you to play with a picture's colors, doodle over an image, merge photos or stamp them with silly images, like a mustache or big cartoon eyes. The fact that the DSi won't let you view images taken with other devices on the portable also seems to confirm that Nintendo understands the draw the imaging tools will have for younger gamers. The DSi sound software isn't nearly as fun as the imaging tools. You can record sound bites with the portable and then change the playback speed and pitch. You can also apply a dozen different sound filters to the noise you record. While the DSi can also playback music, it only supports the not-so-user-friendly AAC file format and not the more readily available MP3 format. Most intriguing to gamers will be the DSi's ability to purchase and download games directly to the portable from the DSi Shop via an Internet connection. While games will likely be the mainstay of the store, it will also give Nintendo the ability to add new functionality to the system, turning it into everything from a day planner to a calculator. A slew of neat features also improve the portable experience. The Dsi doesn't need to be turned off and back on nearly as often as its predecessor, allowing you to switch games on the fly, and even hop to a Wii-like menu without needing to browse programs. The menu, which consists of a line of icons, is customizable and will grow as you download new software as well. But most of the frills seem lost on Tristan, and will likely be equally unimpressive to other young gamers. Instead, Nintendo is once more looking to expand their market by broadening the way their gaming systems are used, turning a portable into something infinitely customizable with much more than games to attract an audience.